Good to Know is a Google site that provides an overview on how to keep your personal information safe while online. While Good to Know is was designed with personal Web browsing in mind, you can use the tools Google offers on to help your employees better understand online privacy to protect both themselves and your clients. 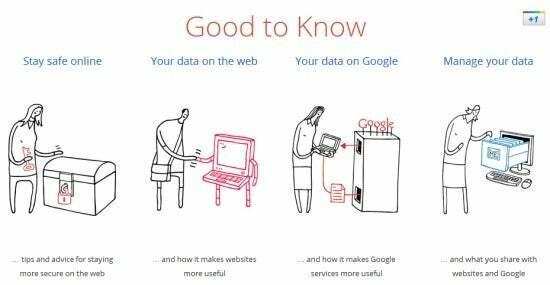 Good to Know is a collection of resources offered by Google that aims to educate the public about online privacy and security in a clear, easy-to-read manner. It succeeds at this with a fresh, easy-to-follow look and jargon-free writing. Google does subtly push its own products and services through the site without mentioning non-Google alternatives, such as with this page's push for Google Chrome as the safe web browser about halfway down, so you should take some of the suggestions on the site with a few grains of salt. While we've covered Google's 2-Step verification before, it is important to adopt it if you're not using it already. For many of us, our Google Accounts are the Swiss Army knives of our online lives and if someone hijacked them, there could be consequences to our personal lives and our businesses. Google 2-Step Verification means that only someone with access to your phone can get into your Google Account, even if they steal your user name and password. Concerned that Google 2-Step Verification would force you to sign in on every device every time? I've been using 2-Step Verification across my Android smartphone, my iPad, and my two computers for about two months now, and I can testify that the experience is seamless. About once every two weeks I'm prompted to re-enter my password on each device, and knowing that it keeps my account secure is more than worth it to me. In one of the site's videos, Google references their own Data Liberation Front. This is an engineering team at Google that specializes in importing data into and wiping data from any Google service in a seamless manner. If you want to remove all of your business's data from a particular Google service, go to the Data Liveration Front website, and click on the appropriate service; you'll then receive clear instructions on how to erase your stuff. While it is a great resource, I would stop short of recommending that you link to Good to Know from a commercial site because it only pushes Google products or services--such as recommending Chrome over other browsers as a "safer" option--while you can find similarly secure options elsewhere. Although I don't disagree with Google's reasoning on why Chrome is safer, this kind of recommendation is unreliable since it is coming from the makers of the product. If you are looking for a spot to send customers to learn more about online privacy, The Electronic Frontier Foundation maintains an excellent resource site on online privacy which offers a third-party view of the subject. Despite the lack of objectivity, Good to Know is still a great resource to have on hand and can be a great internal tool to add to your corporate intranet or other internal resources if employees have any questions about online privacy.